Bravery, abstract thinking, and creative leaps with Dr. Barry Spencer. I read Barry's thesis shortly after it was submitted. And my mind was instantly blown. I have been enthusiastically encouraging Barry to publish the document ever since, as I believe his insight and research into the potential of letterforms and the possibilities of typographic systems is a game changer for our industry and creative practice. Q1: What is a letterform when removed from context? Q2: What am I able to create when all my prior expectations of form are stripped away? Q3: How do I relate to and interact with letterforms that break from the mould of tradition? Q4: How do the outcomes of this openness towards approaching and creating letterforms then influence the work and ideas that follow them? These are big intentions that take a lot of bravery to pursue... So writing about it - wanting to share the thinking, his methodology, (and his exemplary experimental and speculative typefaces) with you - is a monumentally difficult task - primarily because I am afraid I won't/can't do Barry's Brilliant piece of work justice! I began with asking how he defined his four research questions - as I was curious about where the questions came from and if they evolved over time or if he set out on this journey with such an adventurous outlook! "The starting point was being sick of interacting with 'you shouldn't do that' – and 'why would you mess with the alphabet when it is perfect and works the way it is' - approach to letterforms – and my answer was 'Simply, because I can!'" Each question lead to another... Each question became a jumping off point to learn, to transform his understanding and to advance. I noted that working outside of 'the norm' and what is readable, legible and easily understood in typography was incredibly brave as we have a long history of thinking this is the way a letter should look, or this is how we read and visually interpret a particular sign or sound. "my research became introspective – personally, my creativity grew to enable me to do the things I felt comfortable with. I became the client. I moved away from external parties and their views – instead, I focused on how could I use it – how do I see it as a letter – it became personal." Cody (2010) - http://barryspencerdesign.com.au/cody/ also shown on the post thumbnail above. "Cody was the first typeface that I designed that made no attempt to ‘please’ my existing letterform understandings. Born out of an idea that was sparked while playing an otherwise unimpressive video game". British graphic designer Roger Fawcett-Tang is quoted as saying "major experimental break throughs often come from outside the discipline because experts within tend to approach the discipline from a common ‘obedient’ point of view." Amble (2012) - http://barryspencerdesign.com.au/amble/ Vector above and a hand written instance (reading Amble by Hand) below. I loved this face when I first saw it digital but my heart swelled seeing the analogue version! Barry's research was far from obedient - he set new boundaries and new theoretical positions of what a letterform could be. He took a novel approach to his investigation which is precisely why his work contributes new knowledge to our field. "My typographic journey started ‘normal’ and went through a process of re-organising elements – and reassessing the structure of letters." Heiro (2009) - http://barryspencerdesign.com.au/hiero/ Heiro consists of letterforms that aim to imagine letters from a different perspective and address the hypothetical idea that the letterforms that exist within the Latin alphabet are actually a profile representation of the ‘real’ letterforms, which have been corrected to now face the front. This shifted the perception of what a 'letter' had the potential to be, this 'what if' thinking was rebellious and radical - he slowly retrained himself - starting safe and gradually taking bigger and bigger risks with the archetypal form and legibility. 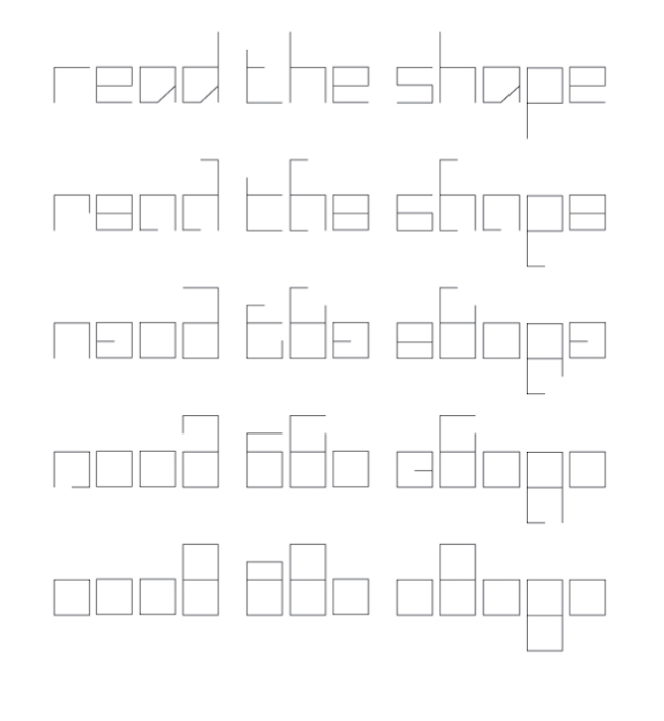 Blank (2006) - http://barryspencerdesign.com.au/blank/ The mechanics which define Blank's character proportion above and the Blank typeface's characters below. In 2005 while Barry was still in a relatively safe visual arena with the type he was producing, he showed his work to David Pidgeon who was most interested in the more obscure (and more experimental) of Barry's typefaces. "The things he gravitated towards were the things that weren't perfect but he felt had been pushed further. Looking back those faces were still really safe, but it opened my mind to the possibilities of doing what wasn't expected. It gave me the courage to start playing with legibility – readability which lead to my questioning of how far can a letterform be taken forward and stripped back before they are no longer letters?" Each experiment leads to more creativity, more courage, more abstract and exciting outcomes. When people look at Barry’s work without understanding his process and research framework they may well struggle to see his letters as letters. But when you follow the evolution of his thinking, and the development of his typefaces over the course of the ten years of practice, you'll understand why and how Barry made the leaps he did. So much of what we do as designers is defined by our published visual outcomes. But the value of our work is in our private design process... Each time Barry guides us (or holds our hands!) through his creative leaps we gain a better understanding of the rigour and processes behind his speculative faces, despite them becoming more abstract and less familiar. Barry’s ability to articulate his process and thinking became critical to making the work accessible to others. I ask how it feels when people don't relate to the work as typography or type design - when they are unable to make that leap? What is a letterform when divorced from content? What makes it a letterform, vs. a symbol, or mark? Barry defines the boundaries between letter and symbol. As he believes, the perception of a letter is wholly subjective. So I ask what comes first the mark or the meaning? Barry is well known for his beautiful use of grids (both geometric and non-orthogonal) as well as systemic modulation in his type design work. I was curious if his visual research and concept design always began with a grid? Barry points out his design methodology is almost always different. Creating Owen, Barry drew a set of glyphs on a grid and then once he had marks he assigned letters for each. I asked Barry about what happens to his precise work when applying the human condition... He tells me he was influenced and encouraged by some calligrapher friends to get analogue. I was curious about what other instances Barry would like to see the work used in? Barry doesn't breaks the rules of visual language and typographic convention to challenge you, he does it to snap us out of our comfort zone and push his own creativity – he is not, however, aiming to replace or even redefine our current alphabet - and is not being different for difference sake. Barry is radically innovating with type design by using gradual jumping off points; each small leap advances the territory of typographic design and our perception of letters a little further. He is expanding our field and wants to share the process and thinking with others. I believe this is important and exciting research. Thinking that our entire design community could benefit from. This is not only relevant to type design, and you don't need to understand (or relate) to Barry’s design outcomes to learn from them. This thesis is a wonderful piece of work propels our design process and encourages us to be brave and better designers. Barry's gradual leaps, using his 'what if' questioning as jumping off points for each project, his courage to take small risks - are all a fast track formula toward innovation. He demonstrates an approach for us all to pioneer new pathways in our design journey. Nikau (2016) - http://barryspencerdesign.com.au/nikau/ I am unashamedly biased but read about why this is my favourite of Barry's Typefaces here!